The Girolamo Romano painting “Christ Carrying the Cross,” believed to have been confiscated by the Nazis during World War II, will be seized by Homeland Security investigators at noon from the Mary Brogan Museum of Art & Science. Federal officials ordered The Mary Brogan Museum of Art & Science not to return "Christ Carrying the Cross Dragged by a Rogue" by the Italian Renaissance artist Girolamo Romano because it is believed to have been stolen by Nazis during World War II. The circa 1538 painting is one of 50 paintings displayed at Tallahassee's Brogan Museum in an exhibit that opened in March. "Baroque Painting in Lombardy" featured paintings on loan from the Pinacoteca di Brera, one of Italy's most celebrated museums. 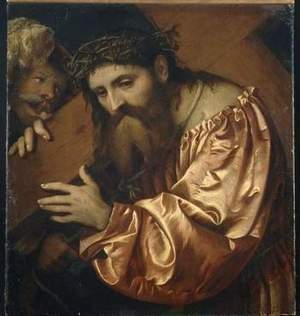 When the exhibit closed in early September, federal officials ordered the Brogan not to return "Christ Carrying the Cross" because it was believed to have been stolen from a Jewish family that fled Nazi occupation in France during World War II. The United States District Attorney Pamela Marsh filed a civil forfeiture complaint this morning and a magistrate judge approved a seizure warrant for the painting. The forfeiture complaint sets the stage to determine the rightful owner of the painting. “We believe the heirs of Giuseppe Gentili are the rightful owners,” Marsh said. The painting's fated is likely to be determined in front of a federal judge in Tallahassee. No court dates have been set.